Week 5 of training for the Fire Investigation dogs at Vikkas Canine Services has been completed and the weather conditions have changed dramatically from the shorts and T shirts of last week to the fleeces and trousers (for me anyway!) of this week’s training. The dramatic temperature change (10-15 degrees) can have a big effect on the scent picture for the dogs. Last week in the heat there would have been a much bigger scent picture which can cause problems for the dogs tracking it in to source, and we did have a few occasions where the dogs were taking longer than usual to track to source, or they were giving an indication on the edge of the scent picture. This week’s cooler air has kept the scent picture smaller, making it easier for the dogs. 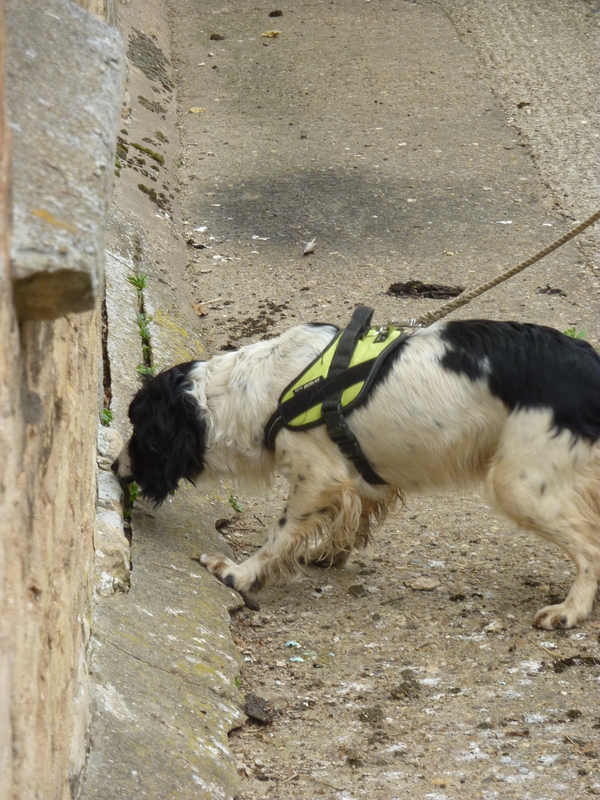 This week brought it’s own challenges for the dog’s as we exposed them to different areas to contend with, both inside and out and the scent was placed in many different types of areas and on differing types of materials. 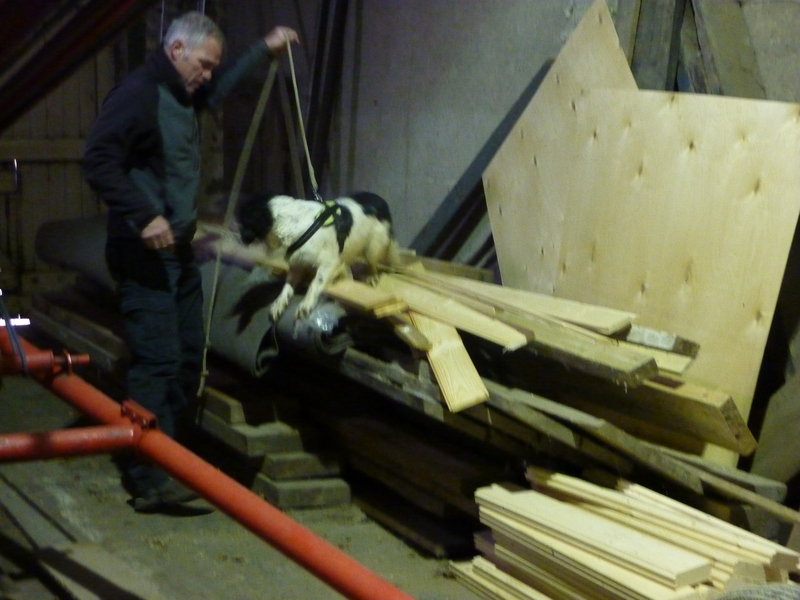 The picture below shows Geoffrey indicating inside a barn area. He has had a really good week’s training and has responded well in all the area’s, demonstrating an enthusiastic and confident attitude towards his work. 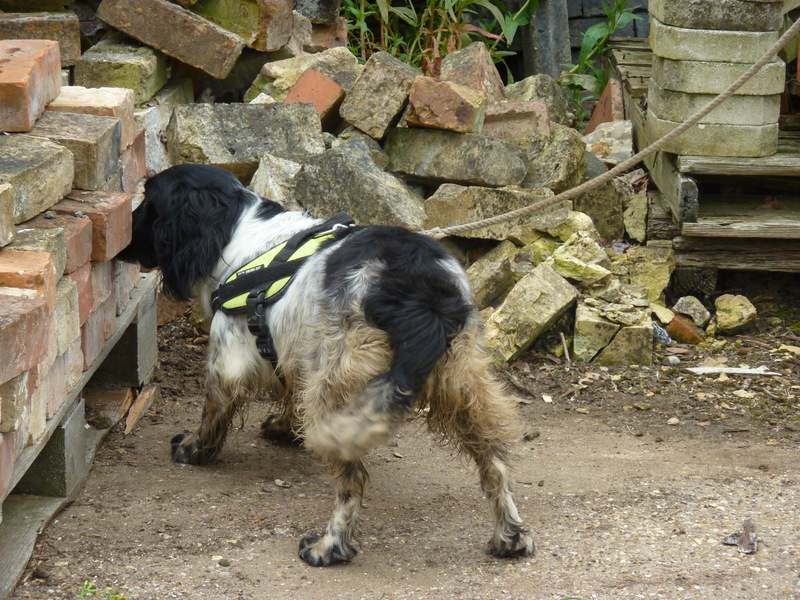 In this shot Millie is giving a great indication on a scent placed amongst a pile of bricks. Millie’s week has also gone well, and like Geoffrey has a confident attitude to any area that she is worked in. She is still in need of verbal backing from her handler when she is working the scent to source but we are confident that in time Millie will demonstrate a solid indication. 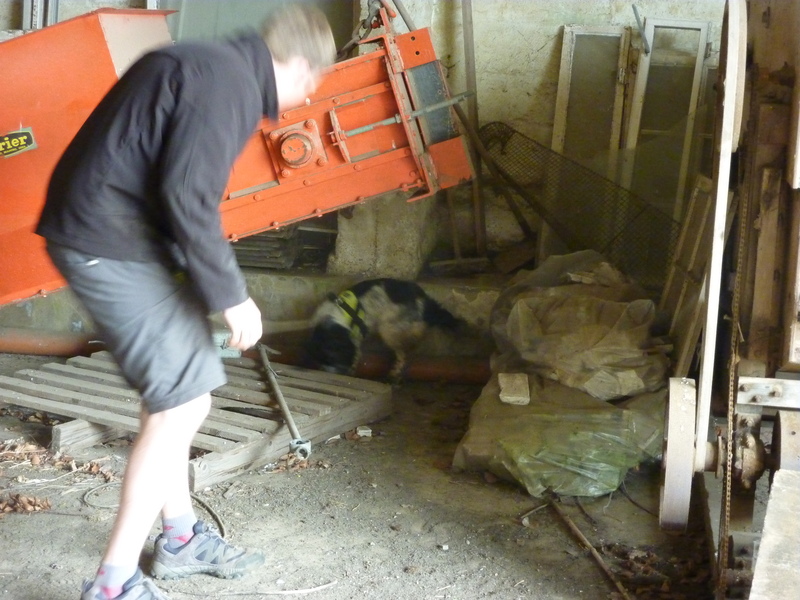 This pic shows Millie working in a tight, dark area which the dogs will be asked to do on a regular basis once they have completed their training. 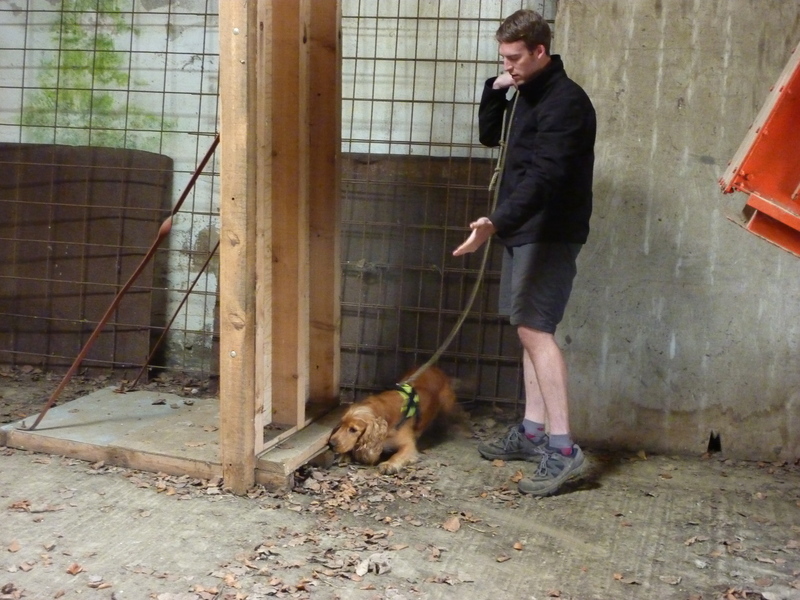 This type of area is also a challenge for Marcus and I as handlers as control of the long line can prove to be difficult in such tight areas as the dogs work their way around equipment and obstacles and the line pulls on the harness. 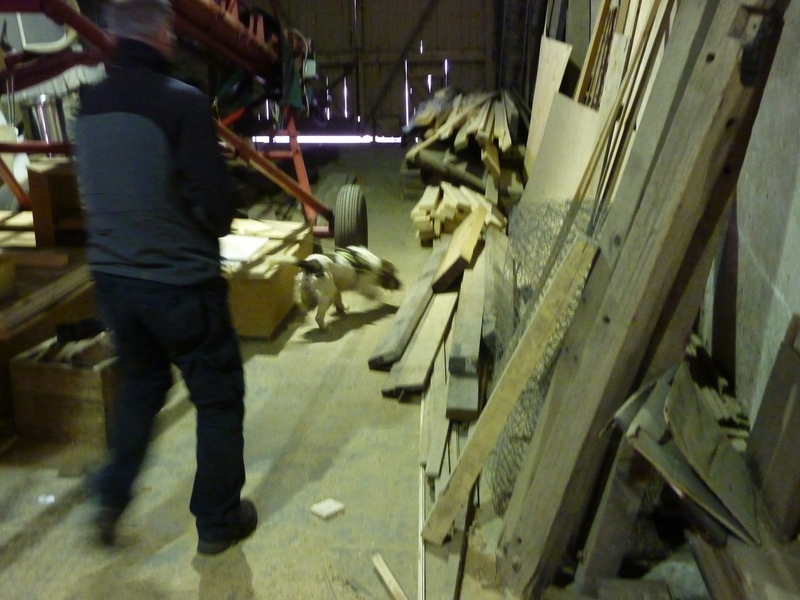 We’ve also been consolidating the outdoor work, and in particular working building surrounds. Here Lucy gives a super indication at the base of a building wall. Lucy’s week has gone well, but she is giving slight concern regarding her concentration levels as the length of each search is increased. Like Lucy, Mansell (below) is prone to lapses in concentration, but progress has been made this week with consolidating his indication. We are getting a more consistent and solid response which is pleasing. As always there is still room for improvement, but there is progress which can be built on. Like all the dogs he has responded well to working in all the new areas.